and a brief prayer by the copyist. ● It is the only uncial Greek manuscript of the Gospels that contains a colophon which mentions precisely when it was made. ● In the decorations that accompany the Eusebian Canon-tables in Codex S, there are not only birds, but also rabbits, lions, elephants and what appears to be an abstractly drawn dragon. ● The chapter-titles for Matthew in Codex S are given in a slightly longer-than-usual form. ● For chapter-titles and section-numbers in the page-margins, the copyist used not only red ink (as expected) but also, frequently, blue ink. 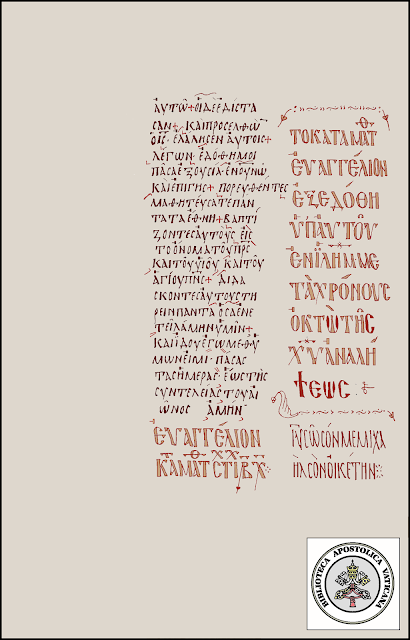 Textually, Codex S is a representative of the Byzantine text. Although Codex S was used for public reading in church-services (lection-titles and date-assignments appear in the margins throughout the manuscript), deviations from the normal Byzantine text that have an impact on translation are fairly rare. Two significant omissions occur in Matthew 9:17 (where Codex S does not have the words, “but they put new wine into new wineskins, and both are preserved”) and in Matthew 19:9 (where Codex S does not have the words, “and whoever marries her who is divorced commits adultery”). Both of these omissions are the result of parablepsis; that is, the copyist’s line of sight drifted from a series of letters in one line to the same series of letters further along in the text. In this case, the copyist’s line of sight jumped from –ουνται to –ουνται in 9:17, and from μοιχαται to μοιχαται in 19:9. Codex S also contains a few – but not many – small benign expansions, such as the insertion of the name “Jesus” in Matthew 21:18. The 2011 edition of the NIV, unlike the 1984 edition of the NIV, gives the appearance of having been translated from a Greek base-text that resembled Codex S in this verse, since it has the name “Jesus” in Matthew 21:18 – even though its preface states that it was translated from the Nestle-Aland compilation, which does not have Jesus’ name in Matthew 21:18. 17r – Matthew 1:1, with a circular headpiece and a zoomorphic initial. 74r – A marginal note alongside Mt. 27, extracted from Origen’s commentary on Matthew, about the name of Barabbas. 114v – Mark 16:9 begins section #234 on this page. 115v – A scribal note about when the Gospel of Mark was written, and a prayer, with a pavilion-framework. 172r – Each line of Luke 22:42-44 is accompanied by an asterisk in the left side-margin, except the last line, where the Eusebian canon-number and section-number occupy the margin. 197r – Each line of the pericope adulterae (John 7:53-8:11) is accompanied by an obelus (÷) in the left side-margin of each column. Yet, a rubric for the passage clearly identifies it in the upper margin; the title “Πε[ρι] της Μοιχαλιδος” appears, accompanied by an asterisk, which is meant to show that the pericope begins at the beginning of 8:3, where another large asterisk appears in the left margin. Instructional notes tell the lector how to treat the passage on Pentecost, by jumping from the end of 7:52 to resume at the beginning of 8:12. 224v – the end of the Gospel of John. 234v - The lections are followed by a colophon which gives the name of the copyist (Michael, the monk and sinner) and the date and year that the manuscript was produced: March 5, in the year six-thousand and 400 and 57. This is an “Anno Mundi” year, calculated from the creation of the world, which Byzantine monks believed to have taken place in 5509 B.C. (a belief based on consultation of the Septuagint; deductions based on the Hebrew text yield a different date). Adjusted to the modern Gregorian calendar, the production-date of Codex S is 949. Codex S, while not as important as Codex B, is among the most significant New Testament manuscripts housed at the Vatican Library. It is an important witness to the Byzantine Text of the Gospels. James, thanks for the analyses and comments. Impressive post and i appropriate you because of your all process amazing thanks for share it resume editing service.